New Education Secretary Betsy DeVos met with women who have been the victims of sexual assault, as well as the accused, and their families, on July 13th in an effort to re-examine the recent campus sexual assault policies of the Obama administration. Specifically, some are concerned that these policies may be significantly violating the civil rights of the accused, going too far. One of these people is the head of the Education Department’s Office for Civil Rights, Candice Jackson, who remarked that the investigations under Title IX have gone “deeply awry.” According to Jackson, many of the investigations behind these cases have not been fairly balanced between the accused and accusing. Specifically, she remarked that in approximately 90 percent of them, the facts do not necessarily support that the accused overrode the will of a young woman. In April 2011, the Obama administration put colleges and universities on notice that the federal government was going to become more aggressive in prosecuting sexual misconduct. Specifically, the administration’s 19-page guidance document warned universities that they could lose millions in federal funding if they did not comply. 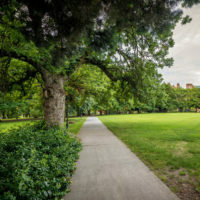 In 2014, the Education Department also published a list of universities that faced civil rights investigations related to sexual violence reports. The most controversial aspect of the guidance document mandated that colleges rely on the “preponderance of evidence” standard instead of the “clear and convincing” evidence standard; the former arguably making it easier to find the accused ultimately responsible for sexual assault. Jackson, however, is concerned that this departs from a fair Title IX discipline process by being weighted in favor of the plaintiff, and very different from how our criminal justice system works. According to the department, there are currently close to 500 open sexual assault cases, where the average length of a case more than 700 days, and the longest pending cases (against Arizona State University and Massachusetts-Amherst) have been open for more than five years. Under Obama’s recent policies, the department is required to complete 80 percent of investigations within 180 days. According to Catherine Lhamon, who led the Education Department’s civil rights office from 2013 to 2016, Jackson’s comments are blatantly untrue, and demonstrate a fundamental misunderstanding of Title IX. Lhamon has described finding “jaw-dropping degrees of noncompliance” when it came to universities failing to take action to protect sexual assault victims. If you or someone you know has been charged with a sexual offense and/or had their civil rights violated, you need to work with an experienced criminal defense attorney who can ensure that your rights are protected in moving forward. These types of charges are complex, and they can have a permanent impact on your life. At the office of Phillip J. Murphy, we provide free consultations during which we evaluate your case and advise you of your rights. We also answer any questions you might have. Contact us today to find out more.